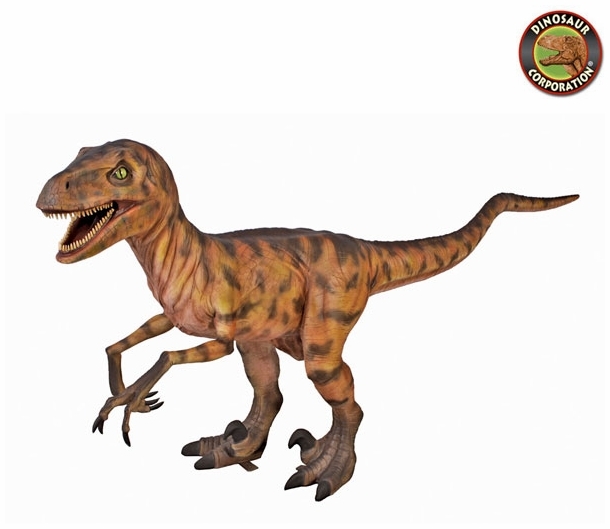 Home | STATUES | Jurassic-Sized Deinonychus Dinosaur Statue 113"
Jurassic-Sized Deinonychus Dinosaur Statue 113"
This Late Cretaceous Period compact carnivore was named Deinonychus, which means "Terrible Claw." They had large, sicklelike claws that sliced through the flesh of its prey. The Deinonychus hunted in packs and inspired the theory that birds descended from dinosaurs. Our prehistoric replica dinosaur statue is cast in quality designer resin, reinforced for supreme strength with fiberglass and hand-painted with powerfully convincing color and texture to be as faithful as possible to the form of its ancient species.